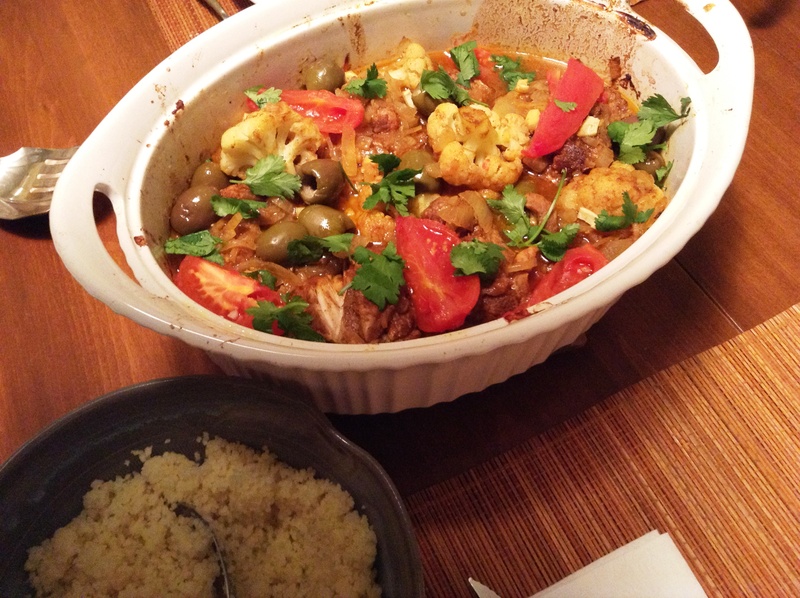 Steve is my brother, and this is his tagine in the photo, but the recipe is Daniel Boulud’s Chicken Tagine from the New York Times. French chef Boulud has a restaurant in NYC. 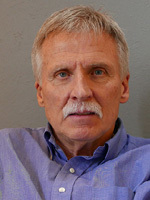 During a phone call Steve told me he made it for his family and they loved it. I was amazed. I had no idea my little brother cooked. If he could prepare, so could I.
Tagine is a North African stew named after the earthenware pot in which it is cooked. During a trip to Morocco, VR and I had plenty of tagine. 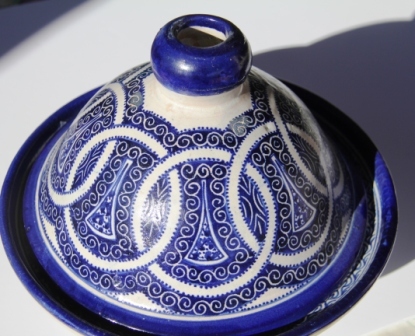 I had to purchase the tagine pot, a beautiful blue and white ceramic model, supposedly old and suitable for cooking — according to the slick Moroccan salesman. First time I used it, the blue paint ran. It is now a decoration. Several years ago I saw a clay version at an outdoor market. 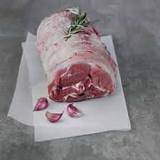 Not cheap, but I bought one and carefully followed the pre-cooking directions – soaking it overnight etc. This one lasted for two tagines before cracking. Now I make tagine in a Dutch oven and serve it in the clay pot. Tagines are made with meat, poultry or fish along with vegetables and often fruit. The spices are the stuff of N. Africa: ginger, cumin, turmeric, cinnamon, saffron, paprika, and chili. Tagines are usually served with couscous. Steve (Daniel’s) version uses cauliflower with chicken. I made it for French neighbors who praised it, although they asked for hot sauce. This version is mild. 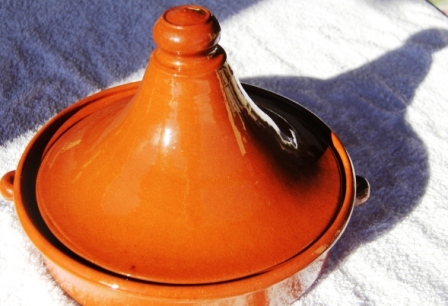 Tagine is common in France due to the large population of North African immigrants (Morocco, Algeria, Tunisia), and it is usually on the piquant side. The following recipe serves four. Combine spices in a dry saute pan set over low heat and toast gently until they release their fragrance, about 2 minutes or so. Transfer to a bowl and allow to cool. Preheat over to 350 degrees F. Season chicken thighs with salt, pepper and 2 tablespoons of spice mix, along with 2 tablespoons of the olive oil. Bring a large pot of salted water to boil over high heat and set a large bowl of ice water to the side. Core tomatoes and score an X on their bottoms. Boil the cauliflower florets in water for 3 minutes, then submerge them in the ice water. Boil tomatoes for 20 seconds and chill them in ice water as well. Remove cauliflower when it is cold, and pat florets dry. Peel the skin off the tomatoes, then cut them into quarters lengthwise. Trim away seeds to make petals. Heat remaining olive oil in a large saute pan set over medium heat and sear the chicken in batches, starting skin side down, until the thighs are browned. Remove chicken to a large Dutch oven or tagine pot. Remove all but 2 tablespoons of the fat in the pan, then return it to heat and brown cauliflower and add to the chicken. Reduce heat below the pan, add the onion, garlic, ginger and saffron. Cook, stirring, until the onions are translucent, about 5 minutes. Add tomato paste and chicken stock, and simmer until reduced by 1/3. Pour sauce over chicken and cauliflower, cover pot and transfer to oven for 20 minutes. Remove, stir in tomatoes, preserved lemon and olives, then cover pot again and cook for an additional 20 minutes or until chicken is cooked through. Garnish the chicken with cilantro leaves, serve in the pot and with couscous. There will be plenty of spice mix left over for another batch or two. It keeps well in a sealed container. Next time, to add heat I plan to add some freshly chopped hot chili pepper with the fresh garlic and ginger.